Learn how to make Wagashi, one of the Japanese traditional sweets. This sweet pursue high quality not only in terms of deliciousness but also beauty. Arigato.kitchen wagashi cooking class offers traditional Japanese sweets making and Maccha green tea. The attraction of Wagashi is not only enjoying its taste but also you can see and feel the season by the looking and ingredients. Let's enjoy eating and looking the Japanese sweets and have a relaxing time. Wagashi is an essential part of Japanese culture and tradition, that is, to enjoy as a treat and an art to express the passing seasons. Wagashi can be enjoyed with its appearance, such as the color and the form. For example, Wagashi in summer can express ‘coolness’ with a clear jelly to represent water or freshness to help getting through the hot and humid summer season. This is another way to learn Japanese traditional and actually experience it by cooking! Sakura Mochi - rice cake with bean paste wrapped in a preserved cherry leaf. Hanami Dango - a Japanese rice cake ball made out of mochiko powder. Sakura Yokan - a thick, jellied dessert made of red bean paste, agar, and sugar. Kashiwa Mochi - a rice cake wrapped in an oak leaf. which is a rice cake stuffed with sweet bean paste. Anmitsu – Gelatin cubes and sweet bean paste with fruits. Milky way Yokan - The special Ama no Gawa (Milky Way) yokan celebrates Tanabata. contains a flavored bean filling. 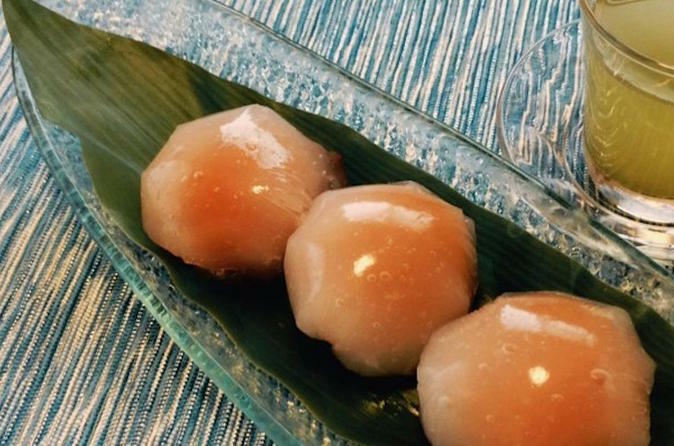 Tsukimi Dango - Rice dumplings in appreciation for the harvest of grains. Black Sesami - It is used for winter Wagashi a lot of time. Mame Daifuku – It is a Japanese confection consisting of a small round mochi, glutinous rice cake, with Anko, sweet paste made from beans. Oshiruko - Sweet bean soup with rice cake. Kinako Ame -Soybean flour candy. Kusa Mochi - a rice‐flour dumpling mixed with mugwort.